Show your timeline of accomplishments with Visible Legacy for free. 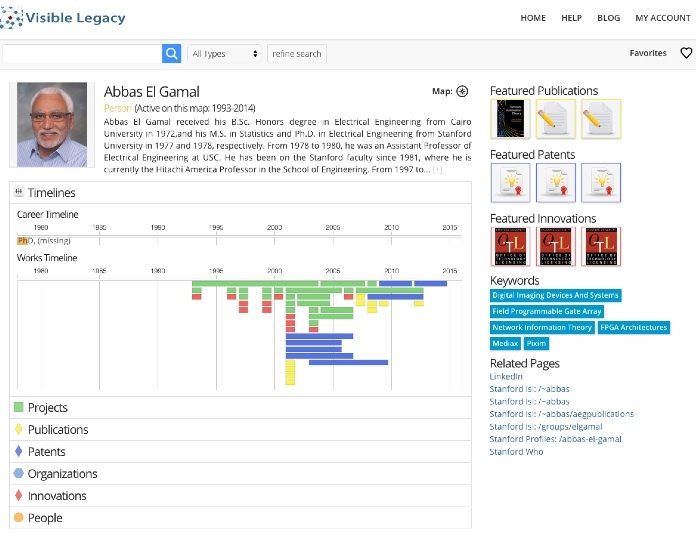 Visible Legacy shows your papers, projects, and collaborations as a map and over time. Visible legacy Navigator and widgets are used by industry, sponsors, and other researchers to find innovations and collaborators. Claim your page to curate what we have gleaned from public sources. Once verified, you can use your account to set featured works, select preferred image and description, and add URLs. It's easy and fast. Create an account and Log In to get started. Using your professional email address for registration will help us validate the claim. Navigator will match your user name to search topics to reveal a special "Claim This Page" menu item. Share your Navigator page link by pasting into email or on your favorite social network. Embed your widget into your own Profile page using the embed code. Invite your colleagues to snap in their URLs to expand the context around your projects and organizations. Tell your story visually. This Login is for Participants who have claimed their maps and want to add more information. Please create a Pro account in Navigator first if you don't already have one.